...or, as many of you know it, 'Downton Abbey'! We are thrilled that the Downton Abbey movie is going to premiere in September 2019. In the meantime, please visit us and enjoy exploring 'behind the scenes' the real history and the beautiful gardens. We never tire of this stunning home and inspiring landscape and we are delighted to share it with each and every visitor. On this site, you will find information about the various events we have coming up, how to buy tickets and plan your visit. Please do read the blog for stories of laughter and fun had by all the staff, upstairs and downstairs, here at The Real Downton Abbey. 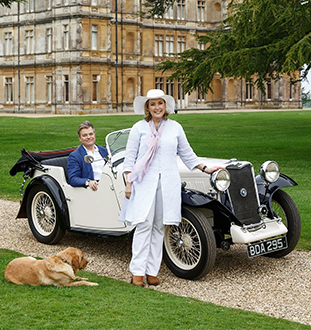 Highclere Castle has a rich, multi-faceted heritage. The first written records of the estate date back to 749 when an Anglo-Saxon King granted the estate to the Bishops of Winchester. Bishop William of Wykeham built a beautiful medieval palace and gardens on the park. Later on, the palace was rebuilt as Highclere Place House in 1679 when it was purchased by Sir Robert Sawyer, Attorney General to Charles II and James II and direct grandfather of the current Earl. Throughout the Second World War, Highclere Castle was home to evacuees, whose names you can see etched into the roof lead. During the conflict, military planes from four nations crashed on the Highclere Estate whilst on active service. The current Earl’s father was the Queen’s racing manager from 1969 until his death in 2001. Today, the Castle is home to the 8th Earl and Countess of Carnarvon.